Rest in Peace, Mr. Hillenburg. You changed the animation game. I will always be grateful to him for Spongebob Squarepants. Rest in peace, Hillenburg. that he had not yet reached old age, unlike Stan Lee did two weeks earlier. I am touched by these dedication pieces. Thank you for your addition. You know, it is so shocking that this man had passed away... And it breaks our hearts. He may be gone but the spirit will never go away. ....does anyone else feel like their heart hurts? It's not just me, right? Now he's with the legends. I know that we're all sad here, but wtf is that finger on Patric's hand? It's still weird knowing that he's dead. First Stan Lee, now him?! 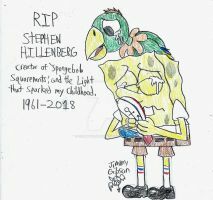 Amazing tribute for Stephen Hillenburg. First we lose Stan Lee, then two weeks later we lost Stephan Hillenburg! This year has been a rough and frustrating year and it’s not even over yet. Hey you’re talking about a different Stefan (Robbie Rotten) here! Ahh.. I’m sorry about that, I’m just... trying to cope with the news with dumb memes. It makes me feel better. Rest in peace, Stephen Hillenburg. You will be missed. You got a thing for tributes, man. Hopefully he’s having fun with the Flying Dutchman now. He will love all those Krabby Patties in heaven. Rest in peace Stephen Hillenburg. No one will be able to replicate your genius. Thank you for creating our childhood, Stephen.